T Alejandro Villanueva vs. EDGE Terrell Suggs – Villanueva’s 2017 is off to a rough start after allowing three sacks in three games when he only allowed six sacks all of last season. The Steelers’ left tackle has a pass-blocking efficiency of 92.8 this season, ranking 47th out of 70 qualifying tackles. Suggs will be Villanueva’s next test. The veteran pass-rusher leads the team in pressures with 12 and 41.7 percent of those pressures come from inside pass-rush moves. That type of pass-rush move causes Villanueva the most trouble, as 40 percent of his pressures allowed come via inside moves. 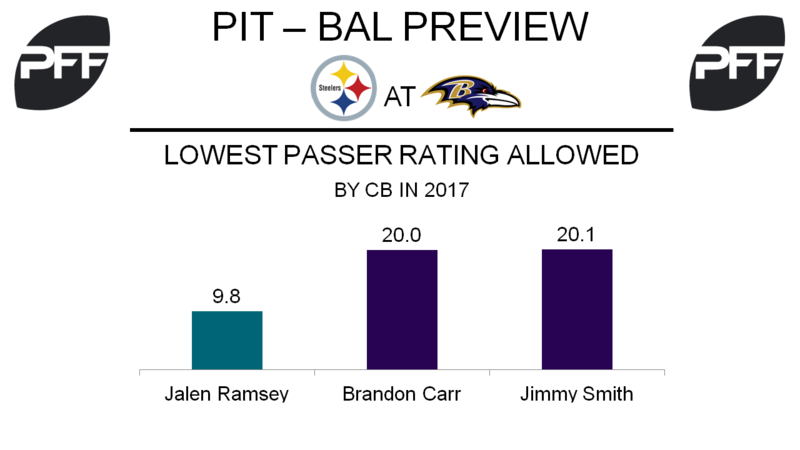 The Steelers only allowed 12 pressures last season to the Ravens, two of which came from Villanueva, but this rivalry has shown anything can happen. WR Antonio Brown vs. CB Jimmy Smith – Brown enters Week 3 as PFF’s highest graded receiver at 90.7 overall and he has yet to drop a pass on 26 catchable targets, the most in the league without a drop. While Brown does move around the field, he lines up at left wide receiver 50 percent of the time, which is the highest of any alignment for him. That means that Brown will see plenty of Smith in coverage, as he has lined up at right cornerback 93 percent of the time this season. Brown was held catch-less and only targeted once in Week 9 of 2016 when he was covered by Smith, but Smith missed the week 16 matchup in which Brown caught 10 of 11 targets. It’ll be one of the league’s best receivers against a cornerback that has allowed a passer rating of only 20.1 this season, third lowest in NFL. TE Jesse James vs. S Tony Jefferson – The tight end position was a question mark for the Steelers after trading for Vance McDonald this preseason but James has logged 16 of the teams 17 tight end targets this season. However, James has been quiet since Week 1 against the Browns, where he saw eight targets and two touchdowns. James’ 126.8 passer rating when targeted leads the team and Roethlisberger does like to target the tight ends, especially in the middle of the field where 10 of James 12 receptions have come. Jefferson has allowed a 75 percent catch rate and two touchdowns to opposing tight ends this season. The highly to touted offseason acquisition has earned a coverage grade 72.0 in 2017, ranking him 37th in the league among safeties. 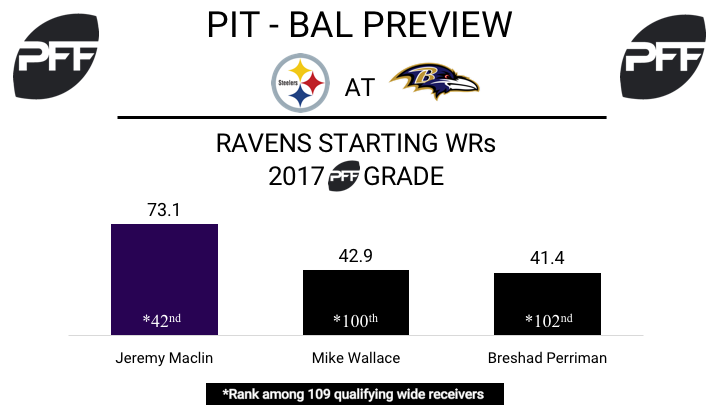 WR Jeremy Maclin vs. CB Mike Hilton – Maclin has been the Ravens’ highest-graded wide receiver to this point, earning a grade of 73.1 thus far. He has scored both of his touchdowns when lined up in the slot, and this week it will be Hilton who will be trying to stop him. Hilton has yet to allow a touchdown this year, and has allowed just 61 yards through three games. QB Joe Flacco vs. CB Joe Haden – It is an understatement to say Flacco has struggled this season. His 67.6 grade ranks 26th among quarterbacks, and he currently has a 7.9 passer rating when under pressure, lowest in the league. To get his 2017 campaign back on track, Flacco would be wise to target Joe Haden this week. The familiar division foe has a coverage grade of just 57.9 on the season (ranked 63rd among cornerbacks), and appears to be in line for another season grading below 60 (currently 51.6 overall). C Ryan Jensen vs. DT Javon Hargrave – Jensen will look to continue to keep the pressure off of Flacco this week, but that’s no easy task against Hargrave. While Jensen has allowed just two total pressures on the year, Hargrave has 10 total pressures, including two sacks, this season. He currently leads all defensive tackles in pass-rush productivity (measures pressure created on a per snap basis with weighting towards sacks).